Need to bring a dish to Thanksgiving Dinner? 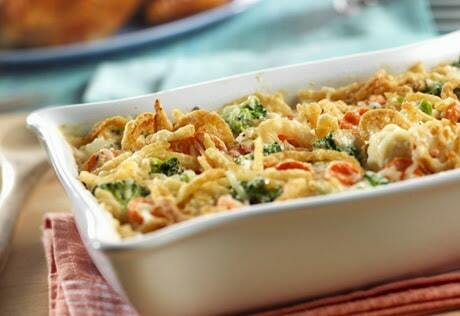 Bring this Vegetable Casserole for a Crowd. It’s not only delicious, it’s easy to whip together and it really does feed a small crowd. I’ve been making this casserole for years and it’s always a hit. In fact, I get asked for the recipe anytime I bring it to a function. I have never substituted fresh vegetables for the frozen but I’m sure you can. Just adjust the cooking time. The original recipe, which I found in an old recipe booklet from Pillsbury, originally calls for cooking all the vegetables separately before combining them with the soup/cheese mixture. This step seemed like an unnecessary step to me. Since the vegetables get combined together and baked anyway, why bake them twice? I prefer vegetables to be al dente’ not mushy, so I simply eliminated this step. Instead I thawed the vegetables, instead of cooking them. What does al dente mean? Most people when they think of the term al dente automatically think of pasta, which is when the term it’s most often used or referred too. But the definition of the term al dente means: Al dente [al-DEN-tay] An Italian phrase meaning “to the tooth,” used to describe pasta or other food that is cooked only until it offers a slight resistance when bitten into, but which is not soft or overdone. Al dente, is a great term to use for vegetables as well. This recipe is called Vegetable Casserole for a Crowd because it makes a nice amount to feed a crowd! Combine all vegetables and chopped water chestnuts. Pour ingredients into a buttered 2 quart casserole dish. In small bowl combine soup, cheese and sour cream, blend well. Season with salt and pepper to taste. Pour over vegetables; blend well. In a small bowl combine topping ingredients; sprinkle over casserole. Cover; bake at 350º for 30 minutes. Uncover; bake an additional 15 to 20 minutes or until heated through and vegetables are fork tender. *I have never made this recipe with fresh vegetables with fantastic results. * *Photo credit: Pillsbury. Vegetable Casserole would be a great accompaniment to Worlds Best Chicken Recipe. Another fantastic ‘vegetable’ dish to make, is for this easy and delicious recipe Slow Cooker Broccoli.